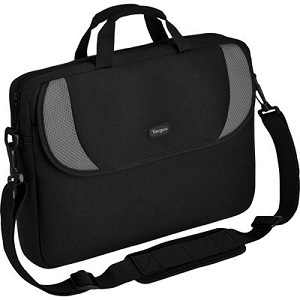 The Targus laptop Sleeve can be used as a stand-alone case or to compliment your existing laptop carrying case. It features a neoprene exterior, which provides protection for your laptop and soft comfortable carrying handles. This slip case accommodates laptops with screens up to 15.4" and even with its compact form factor has ample space in the front and interior storage section for business cards, pens and files. Exterior Dimensions: 16.54" x 13.39" x 2.36"